Historically, Colombia and Venezuela…..recently WORLDWIDE!! Although the Cuatro is most popular in it’s region of origin, the intoxicating sounds of the instruments and incredible possibilities have spread. Modern artists such as Jorge Glem and Carlos Capacho have presented the possibilities of the instrument on an international level, but still a long way to go. There are many cuatro players in Colombia, which would be the second country with most cuatro players in the world. After Colombia, the third country with most Cuatro players would be the United States as many Venezuelan expats brought with them the sound of the Cuatro. Can you believe that there is even a University in Japan which has an assembly which plays traditional Venezuelan music using the Cuatro among other instruments? Modern times have helped the Cuatro gain international presence as we are in the YouTube era and the exposure to new sounds is constant. Not sure if the Cuatro has been actively played where you live? Have a look on our latest geographic presence chart below!! 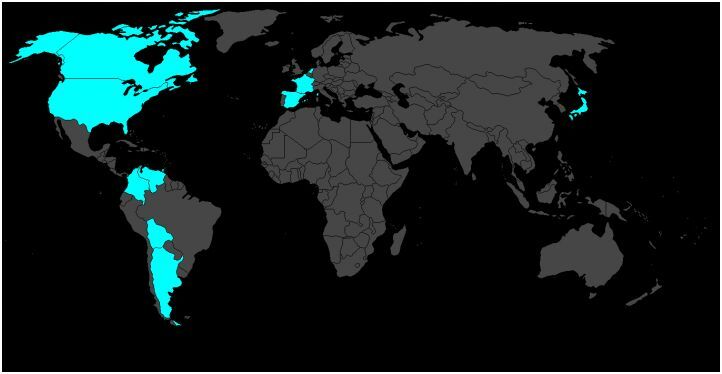 Do you have a Cuatro and your country is not listed? Let us know to add you to the list! After Colombia, the third country with most cuatro players would be the United States, as many Venezuelan expats had bring with them the sound of the cuatro. After Colombia, the third country with most Cuatro players would be the United States as many Venezuelan expats brought with them the sound of the cuatro.